Drive to the end of Winstead, a winding road west of White Rock Lake, any Saturday morning at about 5:30 and Dave Dozier will flag you down. He assumes you are there to join him for a run. On a dewy winter morning he dons a black tracksuit with reflective stripes and he invites early morning guests, runners and walkers, jovial folks he calls friends, into his home of 50 years — cozy quarters whose décor includes display cases full of medals from White Rock, St. George and Boston marathons, to name a few, hundreds, dating back as far as the 1970s, and collages containing magazine clippings and racing bibs. An inconspicuous manila folder contains what we came for: certificates for completing, on foot, a full 9.2-mile loop of White Rock Lake. 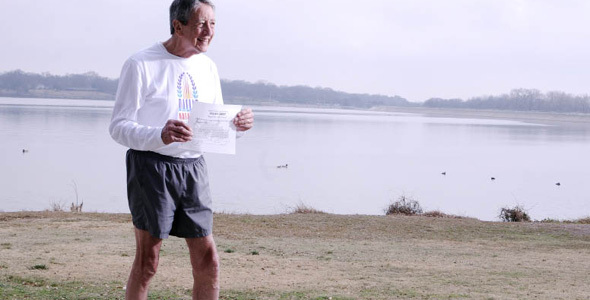 In his early running days, Dozier says, running all the way around White Rock Lake was something only the most serious runners did. In the 1970s a gang of diehard runners including White Rock Marathon founder Tal Morrison challenged Dave to run all the way around, rather than the couple-mile out-and-back jaunts they had seen him performing at the lake. When he eventually took them up on it, the guys gave him a certificate of completion. It is a tradition Dozier continued, mostly under the radar, long after Morrison and the other old timers stopped running. Recently a local fitness magazine publicized the practice and Dozier got an unprecedented amount of takers. But he doesn’t give these certificates away to just anyone. “You really have to do it. I have to see you. I will run with you,” he says. “And you can’t have done it before.” The certificates are reserved for those running the loop and the distance for the first time ever. It’s about the other lake goers. When Dozier ran the first of his 9,000-some lake loops, he says, there were about eight guys regularly running the lake. On a Saturday morning these days, there are hundreds, maybe a thousand. “I stop and talk a lot. I know everyone out there,” Dozier says. It’s about the commitment and motivation one feels after hitting that 9.2-mile milestone, says Stauble, who ran a marathon after meeting Dozier and joining his informal running group. She says it changed her life. If you are interested in meeting Dozier for a run around the lake and, if you make it, a certificate, emaileditor@advocatemag.com.